McKeil Marine commissioned luthier Daniel Clark, owner of Cithara Guitars Inc, to create the custom “MicMac” guitar, named after the first boat in the McKeil Fleet. The instrument pays tribute to the marine industry with its mahogany, cedar, maple, two-tone ebony and bloodwood design. Elegant inlays represent the North Star, a compass and McKeil’s Canadian roots. The guitar was reveal to the McKeil Crew at our 2016 Crew Meeting in February, where it was played by Robin Hawkins. We’re delighted with gorgeous and meaningful instrument that Daniel created in honour of our 60th Anniversary. 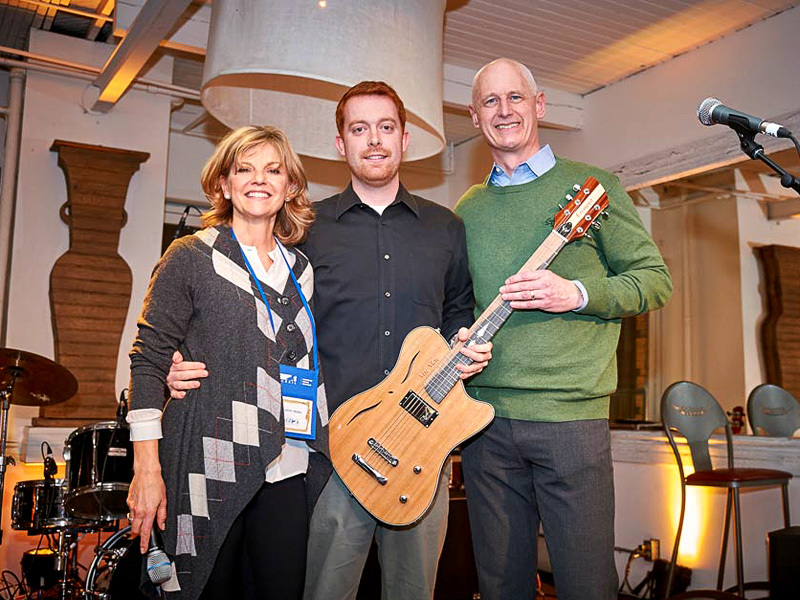 Daniel Clarke was mentored by Blair McKeil through Mohawk College’s McKeil School of Business Entrepreneur-in-Residence program and we are proud of his continued success with Cithara Guitars. Photo Caption: Kathy McKeil, luthier Daniel Clark and Steve Fletcher pose with the custom McKeil 60th Anniversary Guitar, MicMac1956, by Cithara Guitars Inc.